A kinkajou in its native, non-elderly-woman habitat. “This 99-year-old woman is sound asleep, she feels something, she wakes up and this kinkajou—this furry, big animal—is curled up asleep on her chest,” Dr. Don Harris of South Dade Animal Hospital said. Harris said the woman and animal were both startled, and the kinkajou eventually made its way to the attic. 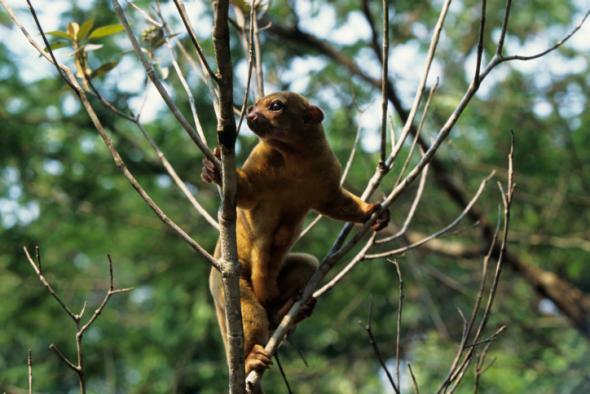 The offending kinkajou was ultimately captured and taken to a veterinarian, where it will reportedly be retrieved by the anonymous individual who keeps it as a pet.